Beautiful color, pure linen and unusual design - everything makes it one-of-a-kind. The dress was crafted to make you feel confident and beautiful. • This dress is made of 100% linen and has pockets. This garment is true to size, and we recommend choosing the size you usually wear. If you have any doubts considering your size, we are always happy to help you to choose. Please, contact us! 100% linen. The fabrics used are EAC certified. The certificate that the products meet all requirements of the corresponding technical regulations and have passed all conformity assessment procedures. You can also purchase an item as a gift. You can make an unforgettable present for the special person. Also, you can add personal message that will be printed and put inside the packaging. We ship items within 3-5 days after the order was made to your ETSY ADDRESS ONLY. Delivery it takes 10-14 working days to Europe and 8-15 days to any other country, but delivery time may vary. To Canada, Australia, New Zealand - 14-25 business days. We accept returns or exchange. If you are not satisfied with your purchase or want to return it - just contact us to resolve this issue, we are always opened to any discussions. We make refunds as soon as you ship the item back and give us the tracking number. We are not liable to pay for shipping and handling charges, gift wrap charges, taxes, and VAT paid as these are all non-refundable. Returns are also at your expense. We do not make refunds if you leave negative feedback before contacting us. If you want to return the item, you can not wash or wear it, it should be returned in its initial state. If you have any questions, just write to me, we will answers within a couple of hours. Do not hesitate to write to me, I will answer all your questions! 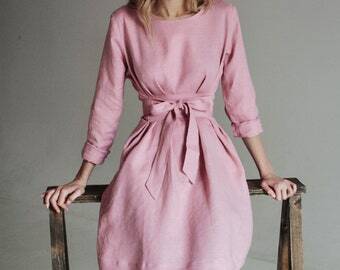 Linen dress. Bridesmaid dress. Linen tunic. 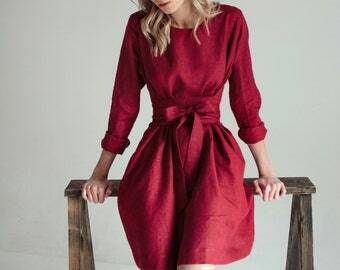 Wrap linen dress. Linen dresses for women. Pure linen dress. Boho dress. Summer dress. The dresses arrived a month after I bought them which is what I expected. I live in the US and they had to be shipped from Kiev. The dresses are great quality and look like the photo. I'm short with short legs so the hem hits a bit lower but I wanted that. I'm 5'1" and 135 lbs and I got a small. Absolutely perfect! Love this dress and it got to NZ sooner than expected! Thank you. 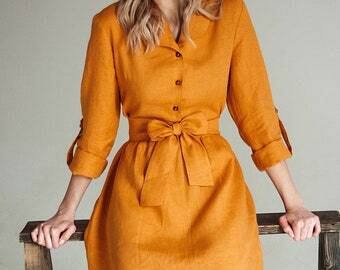 A beautiful hand made dress in medium weight linen, perfect for spring and fall. The shiny buttons are really a nice touch. If you are a S size you can wear it as the model does. I’d you are a M or a L size, you can tie the belt in the back for a very chic look. The experience with the shop was great, and the item was shipped promptly. If you need to receive our product as soon as possible, we can ship your item via DHL. For such order, please contact us. I accept PayPal and credit cards. If you do not have Paypal account, you may pay by your credit card on the Paypal page. Black linen dress. Bridesmaid dress. Linen tunic. 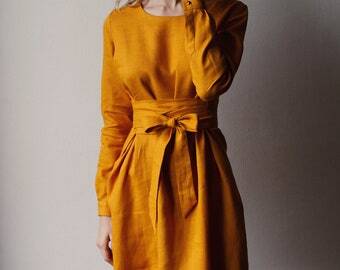 Wrap linen dress. Linen dresses for women. Linen dress. Boho dress. Summer dress. Long linen dress. Bridesmaid dress. Linen tunic. 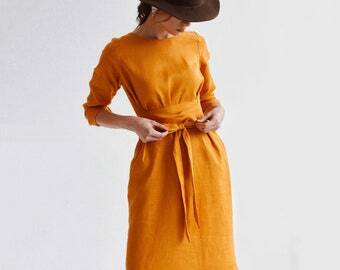 Wrap linen dress. Linen dresses for women. Linen dress. Boho dress. Summer dress.